Who doesn’t love steak? If you are looking for a “sure to please” appetizer for your holiday gatherings, you’ll surely want to add this one to your table. They are quick and easy to make, yet really spiffs up the menu. 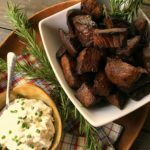 The horseradish whipped cream on the side for dip’n is just right for these steak bites too. Keep an eye out and pick up your preferred cut when on sale. Go ahead and cut up the pieces, then freeze to have on hand for quick fix’n. Even better, go ahead and freeze in the marinade so that all those flavors can spend some time getting to know the steak making your bites even more better! I do hope you will give these a try, and come to my facebook community and tell me what you think. See the recipe where it first appeared in the December 2017 Carolina Country Magazine, or below where you can print. Enjoy this simple addition to your holiday appetizer menu. 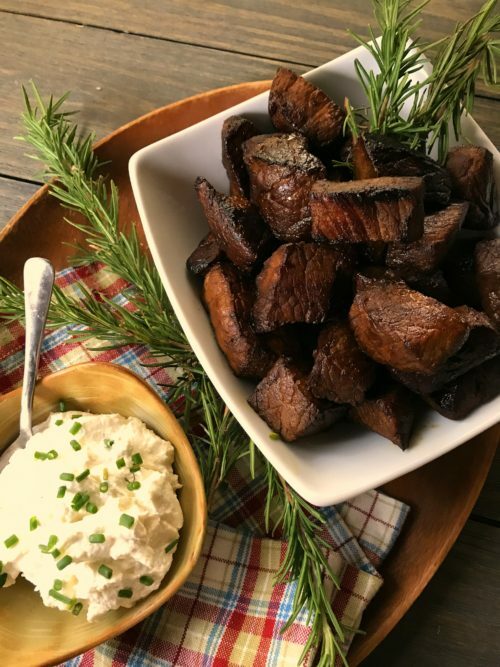 Your crowd will love these flavorful steak bites, as is, or with a dollop of snazzy whipped cream on top! Combine marinade ingredients. Put beef into zippered bag. Pour marinade over, seal and toss to coat. Marinate, refrigerated, 30 minutes to overnight. Heat half the oil and butter in cast iron skillet to medium-high heat. Add steak pieces, making sure not to crowd (cook in batches adding oil and butter as needed). Sear until “crust” forms. For whipped cream: Whip cream until stiff peaks form. Fold in remaining ingredients. Garnish with chives. Serve with steak bites. Note: Be careful not to overcook as the meat will continue cooking after removing from heat. "Chef" Jack Lalanne... a man before his time! Wendy's Dilly Swiss Tomato Pie! Squishy Fig Gingerbread... oooh la LA! « A fun way to enjoy an old favorite… Crab Rangoon Stuffed Mushrooms!